Congratulations to Nyasha Maforo, Biomedical Physics, for winning the UCLA Grad Slam Finals on March 13. Let’s cheer her on as she competes in the UC Grad Slam Competition on Friday, May 10, 2019 to be held at the LinkedIn Headquarters in San Francisco, CA. The event will be hosted by UC President Janet Napolitano, and will be judged by a panel of leaders in industry, media, government and higher education. The first place winners from each of the 10 UC campuses will compete for the systemwide title and their share of $10,000 in prize money. Tune in on Friday, May 10 at 10:30 am via live stream at: https://gradslam.universityofcalifornia.edu and don’t forget to cast your vote for our very own Nyasha Maforo for the Audience Choice Award. Graduate education is the heart of every great university. Graduate students come to UCLA to make creative contributions and research discoveries that advance human knowledge. Grad Slam is a campus and UC-wide competition that showcases and awards the best 3-minute research talks by graduate students. Think TED Talks on steroids. The competition aims to strengthen graduate students’ presentation and networking skills, as well as their ability to distill down and articulate their research concisely and effectively to a non-specialist audience. Grad Slam was comprised of preliminary and semi-final rounds, culminating in a final competition and reception that was held on Wednesday, March 13, 2019. A recorded livestream video of the event can be found here. There were information sessions, public speaking workshops and small group coaching sessions provided to students to help them prepare for the competition. The competition is open to all currently registered and enrolled UCLA Master’s and doctoral graduate students. Students must be registered and enrolled during Winter Quarter 2019 and be in good academic standing in order to participate in the Grad Slam and to be eligible to receive any prize. Students on an official leave of absence, paying a filing fee, or with lapsed status in Winter 2019 are not eligible to compete. Students are only allowed to enter the competition individually. Joint presentations with other students are not permitted. Students must meet the guiding principles of the Office of Intellectual Property and Industry Sponsored Research. Students who competed in previous Grad Slams are eligible to enter the 2019 competition if they DID NOT win 1st, 2nd, or 3rd place. The Audience Choice winner IS eligible to participate in Grad Slam again. However, if that person also placed 1st, 2nd or 3rd, they are not eligible. Why Should I Enter Grad Slam? Viola Ardeni, Italian – What Are Fairy Tales? How Do I Register for Grad Slam? Registration for the 2019 competition is now closed. Please check back next year for the 2020 competition! Need more convincing to enter the competition? Read the Grad Slam stories of past competitors. UCLA’s Grad Slam challenges graduate students to present a compelling presentation of their research in just 3 minutes using language appropriate for a non-specialist audience. We strongly encourage Humanities and Social Sciences students to enter the competition. Last minute cancellations are strongly discouraged. On the day of your scheduled presentation, plan to arrive at the venue 10-15 minutes before the event start time to allow for check-in. Presentations during each round will be in random order. You must be present for the full duration of your scheduled round. Presenters are limited to a maximum of three (3) PowerPoint slides. No other formats (Prezi, PDFs, etc.) are acceptable. Slides are optional. If you choose NOT to use slides, please inform the organizers in writing in advance of your designated presentation so we can make a note of it. Please include a plain white fourth slide that includes 1) your presentation title, 2) your name, and 3) your area of study. We will import this information on to a standard Grad Slam cover slide for you and put at the front of your presentation. Use the 16:9 aspect ratio slide size for your presentation. No animations are allowed. This includes on-click animations that make information or images appear or disappear on a slide at your command or in a timed sequence. However, if there is an animation contained within an embedded video it may be used. Embedded audio and/or video clips will be allowed (clips may contain GIF animation). All work on the slides must be original to the student and cannot be generated by a professional. All presentations will be pre-loaded on the laptop on the day of the competition. You will be required to upload your PowerPoint presentations to a designated site the day prior to your scheduled competition. Specific upload instructions will be sent to each student presenter. Props are allowed, but need to be cleared by the Grad Slam program director, require minimal set-up and not produce a mess. Please email gdevents@grad.ucla.edu if you plan to use props. The room will be set-up with a laptop, projector, remote slide advancer, laser pointer and lavalier microphone. There may or may not be a podium in the room, depending on the venue. However, use of the podium is strongly discouraged. Grad Slam is about effective COMMUNICATION– engaging your audience in key aspect of your research that excite you, that tell the best story to people outside of your field. Think about what sets your research apart from what has already been done already. What makes your work unique and valuable to your field? Think about commonplace references you can make to relate to your audience and draw them into your subject. Humor is often a good tool, as are rhetorical questions. The images you use on your slides should complement or illustrate what you are communicating verbally. Make sure they are relevant to your message. Do not fill your slides with data, charts, or graphs that require a lot of explanation. Do not fill your slides with so much content that the audience will be spending time trying to it all figure out what, rather than listening to what you are saying. Stay away from acronyms unless they are well-known or you can quickly explain them. Same with jargon and complex terms. You will need to briefly define them. Practice, practice, practice so you know all of your content by heart. Slow down and relax. Don’t speak too fast. Clarity and being comfortable with your content is key. Practice presenting in front of your roommate, friends or family members — people are are not greatly familiar with your topic/research. They are great sounding boards. Have fun with this! Your work is valuable and YOU are the expert. You have a lot to teach the rest of us and we’re here to listen. The audience may be comprised of graduate students, faculty, staff, campus leadership, alumni, donors, friends and family of the presenters, and members of the general public. We encourage all the students participating in the Grad Slam competition to invite colleagues, mentors, friends and family to your competition round. An official photographer and/or videographer may also be present at some of the preliminary and semi-final rounds and at the final competition. As stated in the competition registration, any videotape footage, photographs, film and/or audio recordings will be used for UCLA archival and marketing purposes. No commercial use of the recordings are intended or will be authorized. Members of the media may also be present and covering the competition. The final competition on March 13th will be broadcast live online. The Graduate Division is very pleased to provide the following prep workshops for Grad Slam entrants. The workshops are open to ALL graduate students, as well. As a graduate student, you’ve made countless sacrifices in order to pursue your dream of making an impact in your field of study. But to truly make an impact, you need support and a following of people who care about the work you are doing. In this workshop, you’ll learn how to craft a compelling presentation that inspires your audience and promotes your research in an authentic way. The principles you’ll learn can be applied in any setting but the activities will be tailored to include Grad Slam best practices. Megan Eigenbrod is the Training and Career Development Coordinator for UCLA Campus Human Resources. Megan fosters the professional development of UCLA administrative staff by providing training in leadership development, communication skills, and presentation design and delivery. Megan received her Master’s in Counseling and a Graduate Certificate in Career Counseling from California State University Northridge. She has presented at several conferences including the Strengths in Educational Leadership Conference hosted by the Gallup Organization. Kelsey Duff is a Training and Career Development Coordinator for UCLA Campus Human Resources. She coordinates the Staff Enrichment program where she offers career coaching, facilitates workshops on presentation skills, design and visual thinking, and more. Kelsey is UCLA graduate and a career UCLA employee with a background in academic advising, student support and professional development for others in student support positions. In 2018, she managed the recruitment and selection of conference presentations for the UC Academic Advising Conference, where she also presented for the third time. This workshop will help you articulate your information and content in a manner that is well received by a “non-specialist” audience increasing retention. By the conclusion of the workshop you will improve your understanding of how adults prefer to take-in, process, and synthesize new knowledge allowing your presentation to resonate with a disparate audience. You will learn your own primary, secondary, and tertiary preferences for taking-in new information, thereby mitigating subjectivity in your delivery, ensuring your presentation is relevant to an audience outside your career field. These workshops are open to all UCLA graduate students. Reginald designs and develops workshops for skill improvement and facilitates talent and leadership development courses. He is a Myers-Briggs Personality Type Indicator (MBTI®) Certified Practitioner, a qualified DiSC® Classic facilitator and the UCLA Health Sciences appointee to the University of California, Office of the President Talent Management Consortium. A published author, a seasoned keynote speaker and a Society of Human Resources Certified Professional, Reginald holds a Master of Arts degree in Organizational Leadership from Chapman University, an Executive Certificate in Public and Non-Profit Leadership from Chapman University, and a Bachelor of Arts degree in Professional Communication from California State University, Los Angeles. The content of any presentation is critical, however, if you want your audience to understand, retain, and recall your message, powerful and complimentary visual aids will help you achieve those goals. This interactive workshop will introduce the audience to universal design principles that can be applied when creating visual presentations using any platform, such as PowerPoint, Prezi, and Haiku Deck. In preparation for the 2019 Grad Slam competition, the audience will practice applying these principles within the context of the PowerPoint rules and examples from previous finalists will be shared. Participating students must come prepared with a draft of their presentations. These small group sessions will give students the opportunity to present before the group and receive feedback both from the coach and Grad Slam peers who will also be in attendance. These sessions are for Grad Slam participants only. PhD Comics Two-Minute Thesis: PhD Comics challenged graduate students to explain their work in two minutes – the best have been turned into videos! 3 Minute Thesis Competition Winners: Winning presentations from a multi-university thesis competition in Australia, New Zealand, Hong Kong, and the South Pacific. The UCLA campus winner will travel to San Francisco to compete in the UC Grad Slam competition at LinkedIn. Attendance is by invitation only, but will be broadcast live via video stream. There will also be an online People’s Choice vote. So mark your calendar so you can tune in! 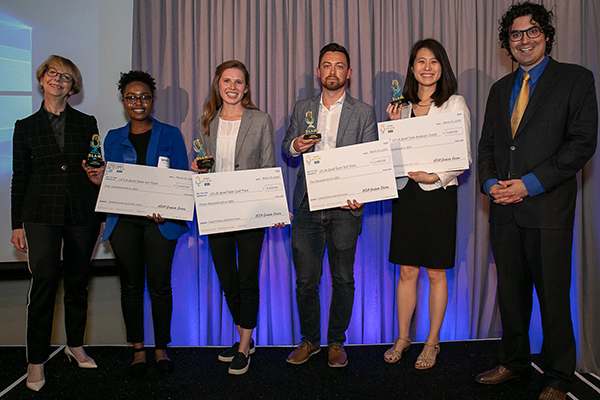 Congratulations to the winners of the 2019 UCLA Grad Slam! The Greenberg 2nd place ($3,000) – Allison Daly, Molecular Biology – Your Immune System, Your Best Friend Or Worst Enemy? Eunjoo An, Nursing – Shouldn’t We All Be Practicing Mindfulness? Allison Daly, Molecular Biology – Your Immune System, Your Best Friend Or Worst Enemy? Alina Arseniev-Koehler, Sociology – What Are We Teaching Our Algorithms? Lionel Levine, Computer Science – What Happens When Your Life Becomes Part Of A Computer Game? Judging panels for the preliminary and semi-final rounds will be comprised of faculty, academic deans, administrative staff, alumni, postdoctoral scholars, donors and elected officials. Great effort is made to select judges that represent diversity in discipline, as well. Presenters will be judged on the clarity and delivery, and their ability to provide context and engage with a non-specialist audience helping others understand and appreciate their research. Timing of each presentation will commence from the moment the student begins the presentation. The presentation begins at the moment the student engages with the audience. Thus if s/he starts with a hand clap, a gesture, an audio or video clip or any other such engagement, prior to speaking, the clock begins at that time. If there is no such alternative engagement, the clock starts when the student begins speaking. Judges will not be allowed to ask any questions of the presenters following their presentation. First, second and third prizes will be awarded during the final competition, as well as an Audience Choice award. If the Audience Choice awardee is the same as the first, second or third place winner, both awards will go to that person. We are very pleased to announce that this year we are able to increase our prize amounts to the following! The prize money is a stipend and is considered income. It will be taxed and a student’s financial aid eligibility may be adjusted, as a result. The system wide competition will feature the first place winners from each of UC’s 10 campuses who delivered their 3-minute research talks. The event will be hosted by UC President Janet Napolitano. 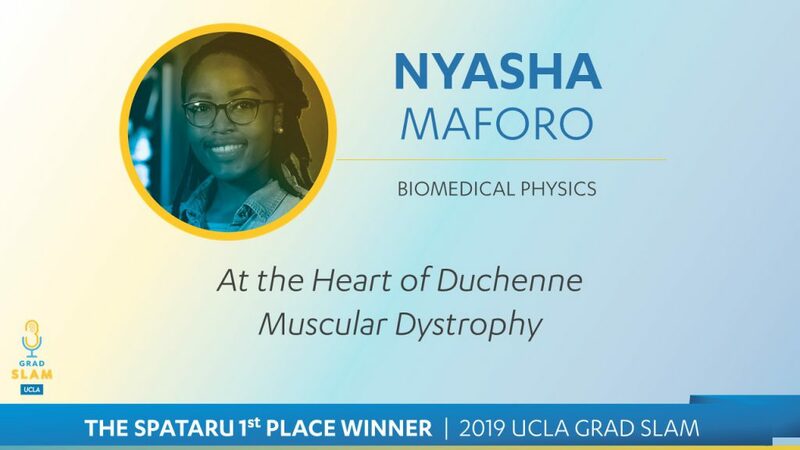 Nyasha Maforo, Biomedical Physics – At The Heart of Duchenne Muscular Dystrophy –– will represent UCLA on May 10, 2019 in San Francisco. 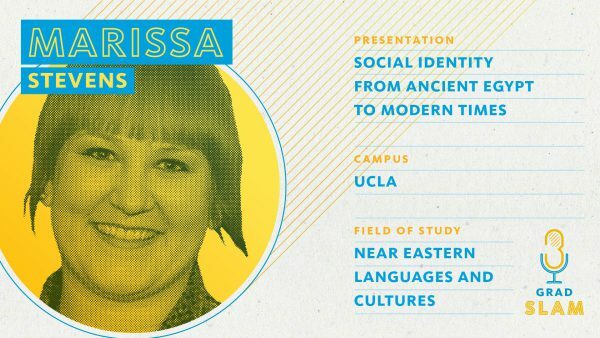 Marissa Stevens, Near Eastern Languages and Cultures – Social Identity from Ancient Egypt to Modern Times –– represented UCLA in the 2018 UC Grad Slam Competition. Locate UCLA by zip code (90095) or by street address (405 Hilgard Avenue). Call 310-825-4321 for recorded directions. UCLA’s main campus is bounded by Sunset Boulevard. on the north and Le Conte Avenue. on the south; the east border is Hilgard Avenue and the west border is Gayley Avenue.